Date: November 21, 2013 Author: Nancy Van Leuven, Ph.D.
It’s a great hashtag to follow, an ‘unsettler’ of how traditional media covers indigenous issues. 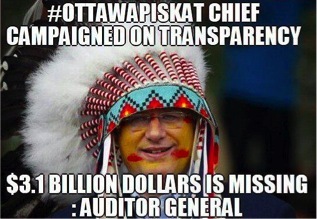 #Ottawapiskat Chief sees “As long as the sun shines, the grass grows and the rivers flow” clause as loophole in treaty. Destroys environment!